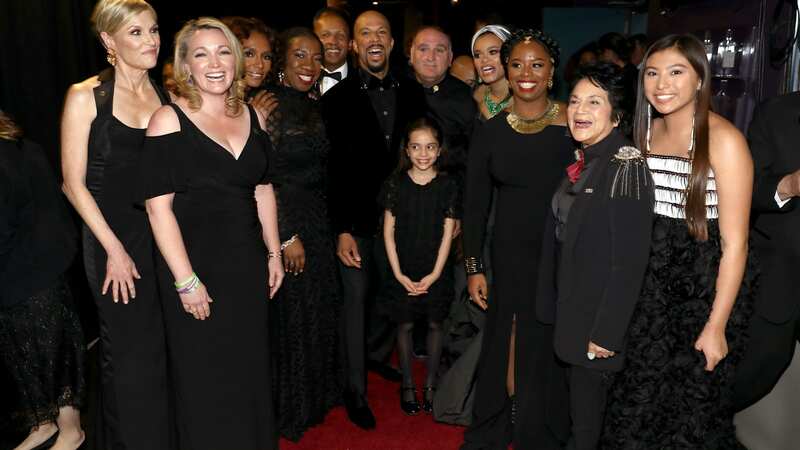 Common and Andra Day brought their Oscar-nominated song "Stand Up for Something" to life by inviting 10 activists to share the stage during the 90th annual Academy Awards. From sparking movements like #BlackLivesMatter and #MeToo to advocating for gun and criminal justice reform to speaking their truth as an activist for transgender, women's, and refugee rights, these women and men are spending each day fighting for a better, more equal world. "These are all people who have fought through their own personal pain to make things better for themselves and for others," Day said. "My prayer is that seeing these people and what they do is that catalyst to find the courage to stand up and to serve. I'm of the opinion that, as people, in our essence, we were designed to serve each other and society at large." This is the woman behind the well-known phrase, "Si se puede." As a lifelong activist and a MAKER, Huerta has spent decades fighting for farmworkers' rights. As the founder of United Farm Workers, she helped lead the infamous boycott against the grape industry which helped gain better working conditions for farmworkers. Burke is the founding force behind #MeToo. Twenty years ago, she helped create a movement long before hashtags. Now, as her message has taken Hollywood and the rest of the world by storm, she continues to fight harassment and give women of all backgrounds a voice. In 2012, Hockley suffered the unimaginable: She lost her 6-year-old son, Dylan, during the Sandy Hook shooting. From that tragedy, she's channelled her pain into inciting change so that no other parent has to live through the same loss. As the founder of Sandy Hook Promise, she is on mission to reform gun laws and help keep kids safe. A member of the Standing Rock Youth Council, 14-year-old Otter is fighting for the Standing Rock and #NoDAPL movement. Protesting the construction of the Dakota Access Pipeline, she ran more than 1,500 miles from Standing Rock Sioux Reservation in North Dakota to Washington, D.C.
A modern-day civil rights activist, Cullors co-founded Black Lives Matter in 2013. The organizer and Fulbright Scholar's mission is to lift up those who have been historically marginalized in society. At just eight years old, al-Abed is a war survivor, Syrian refugee and an author. In 2016, when the Syrian city of Aleppo was under siege, it was al-Abed's tweets that helped garner the attention of the international audience. She went on to publish the book Dear World which tells the story of her family in Syria. Mock founded the #GirlsLikeUs campaign that focuses on empowering trans women through resources and support. Using her personal experience as a transgender woman, she hopes to shine a light on other women's struggles. The legendary pro-choice activist has spent the past 12 years at the helm of Planned Parenthood, fighting for women's access to healthcare. Stevenson is the director of the Equal Justice Initiative, which focuses on criminal justice reform and is helping end the system of racial and economic injustice. As a widely acclaimed public interest lawyer in Montgomery, Alabama, he has dedicated his career to helping the poor, the incarcerated and the condemned. Owner of ThinkFoodGroup, Andres is an internationally-recognized chef who is using his platform to help those affected by Hurricane Maria in Puerto Rico. Working with World Central Kitchen and #ChefsforPuertoRico, ThinkFoodGroup has helped served more than 3.3 million meals to those who continue to struggle after the 2017 storm ripped through the Caribbean.